Creating homemade pierogi is not as tough as you might think, and if you break down the dough making, cutting, filling and cooking into three days, it's really a snap. Making pierogis is a great way to spend an afternoon with the kids and grandkids. 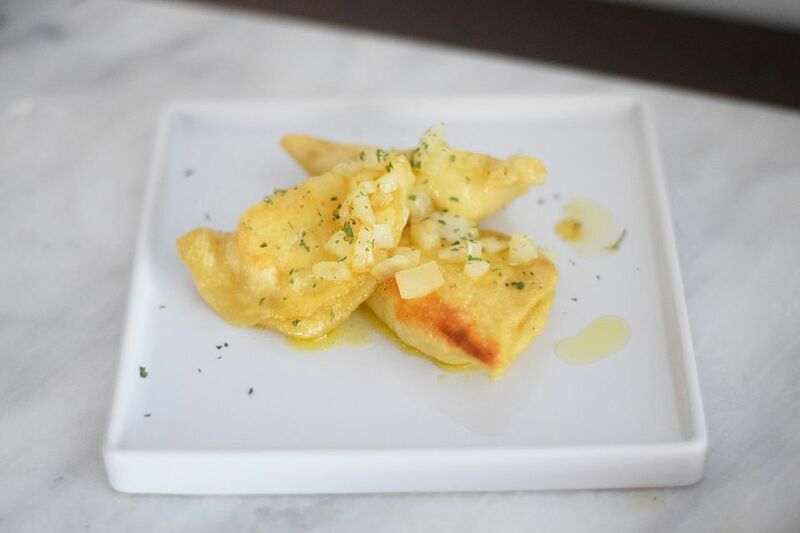 Pierogis freeze well, cooked or raw, so you can enjoy them for weeks at a time. On a lightly floured surface, roll out of your choosing to a 1/8-inch thickness. If rolling dough the conventional way is difficult for you, use a pasta machine. With clean, dry hands, fold dough over filling to create a half-moon shape. Press edges together, sealing and crimping with your fingers (or use a fork) as for a pie. If dough is dry, moisten edges with egg wash (1 egg beaten with 1 teaspoon water) before pressing edges together. Roll, cut and fill reserved scraps. Pierogi can be boiled fresh or frozen. Bring a deep pot of salted water to a rolling boil. Reduce to a simmer and drop 12 pierogi at a time into water. Stir once so they don't stick to the bottom. When they rise to the surface, cook 3 minutes or until dough is done to your liking (based on the ​thickness of dough). Remove with a slotted spoon to a platter that has been smeared with butter. Pierogi will stick together if drained in a colander, even if the colander has been coated with cooking spray. Repeat until all pierogi are cooked. Serve with melted butter, confectioners' sugar (for sweet fillings) and sour cream, if desired. Or sauté in melted butter until golden (see the next step). Pierogi can be fried after boiling if desired. Add 1 stick butter to a heavy, large skillet, and fry pierogi on both sides until lightly browned. If frying savory (non-sweet) pierogi, you may add 1 cup chopped onion to the butter and sauté until translucent. Add pierogi and fry until golden on both sides and onion is tender. Serve hot with onion, sour cream and bacon bits on the side, if desired. Pierogi can be frozen raw or cooked. On a parchment-lined baking sheet, arrange raw or cooked, cooled pierogi, making sure the ends don't touch. Place in freezer. When they're completely frozen, transfer these IQF (individually quick frozen) pierogi to a zip-top plastic bag for freezer storage up to 6 months. Take out as many or as few individual pierogi for cooking on an as-needed basis.